But Vishal Bhardwaj’s Haider isn’t “just” an adaptation of one of the most celebrated English plays ever (which would have been a big enough challenge) – it is also concerned with the recent history of Kashmir, which is an immediate, politically charged subject (so charged that the film has already run into trouble for its refusal to treat the Indian Army as unblemished angels of mercy and righteousness). And what made Haider compelling for me was the friction I sensed within the film: a conflict between the need to do well by Shakespeare – to do new things with a major literary text that has universal appeal – and the need to address Kashmir’s complexities. This tightrope act gives a pleasingly schizophrenic quality to a movie that is, after all, about a young man on the cusp of madness. – Can a script that carries the load of Kashmir PLUS Hamlet avoid patches of heavy-handedness? Probably not, but Haider acquits itself well in the circumstances. I liked the non-underlined way in which this story's Gertrude – Haider’s mother Ghazala, wonderfully played by Tabu – becomes a sort of symbol for Kashmir herself: the object of desire or (blood)lust, the thing that needs to be possessed (the film isn’t coy about Haider’s own ambiguous relationship with her), the woman – “our sometime sister, now our queen” – whose very body is a battleground (an idea literalised in an explosive climax where Ghazala is given more agency than Gertrude has in the closing moments of the play). – Other noteworthy things are done with the original text, such as the use of the character Roohdaar, who presents himself as the “rooh” (soul) of Haider’s father, a mouthpiece for a dead man. It’s a good way of sidestepping the supernatural aspects of the play, but it also ties in with a basic ambiguity in Hamlet itself: until the moment of Claudius’s confession, we can’t be completely sure if Hamlet’s father really was betrayed and murdered; the prince might be hallucinating, or the ghost might be a malevolent spirit leading him astray. In Haider, the very nature of the setting – the moral murkiness, the deceptions and counter-deceptions – is such that there exists at least a small possibility that young Haider is being set up. This adds a layer to his madness, uncertainty and his rambling, Toba Tek Singh-like soliloquy, which touches on how the people of Kashmir are caught in events they can’t fully understand. Which side, which border to trust? 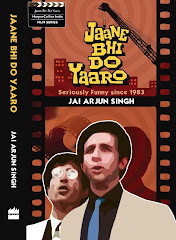 – Scenes such as the gravediggers’ goofy song “So Jao” are reminders of how similar Shakespeare’s work is to a certain type of Hindi film: the episodic structures with constant shifting of moods and tones, the melodrama and the cheerful bawdiness, the use of clowns as sutradhaars who get to say unexpectedly profound things. Watching the “Ek aur Bismil” sequence where Haider confronts his uncle during the course of a celebratory song, even someone who knows his Hamlet might forget the play’s the thing wherein I’ll catch the conscience of the king and instead recall “Ek Haseena Thi” in Karz – but of course Shakeapeare’s “lowbrow” dramatic flair has influenced popular Hindi cinema for decades, and that Karz song is part of the tradition. This is also one reason why Haider’s wildly over-the-top Rosencrantz and Guildenstern worked for me. Turning these two spy-buffoons into Salman Khan-obsessives in a video parlour (complete with the playing of “Tumse jo Dekhte Hi Pyaar Hua” on the car stereo in a grim late scene) was an inspired touch. It’s loud, cutesy, front-bencher stuff…and I think Shakespeare would have heartily approved of it. I liked the way the film ended, but I felt it might have been even better if the last shot had been the one of Haider indecisively holding the gun over his uncle’s head, and a simple fadeout on that image, along with the dual voiceover, one voice urging revenge, the other urging restraint: that would have been a fine encapsulation of the “to be or not to be” (or “to do or not to do”) theme, and an image of Kashmiri lives in a state of suspension. P.S. Shortly after writing the above, I spoke with Basharat Peer who, in preparing the Haider screenplay, revisited Hamlet and simultaneously drew on his own wide-ranging experiences of Kashmir (including some that have been chronicled in his excellent Curfewed Night). Basharat said he wasn’t consciously thinking of Ghazala as a symbol for the “motherland”, but in writing the character – and in trying to make this Gertrude a more active participant – he had in mind the many stories involving unsung heroines from the Kashmir struggle: women who are often forgotten in official and unofficial records, and who defy the stereotype of the submissive Muslim woman who stays at home with eyes lowered. The gravediggers too were inspired by some of the old men Basharat knew who were running around trying to save – or avenge – their children. “When we talk of the violence, we usually think of young, able-bodied men," he said, "but there are so many older people too who picked up guns after losing everything. And people like that don’t do this for big ideological reasons, it is purely personal: you lose your child, and all you want to do is destroy the world. It’s all part of the overwhelming complexity of what has happened in Kashmir, where the personal is always mixed up with the political.” I thought it notable how this view of embittered old people, dealing with grief, knowledge of mortality and the possible meaninglessness of it all, fits so well with the absurdist-nihilistic graveyard scene in Hamlet, and with Vishal Bhardwaj’s own dark sense of humour (also mentioned here and here, in the context of his collaborations with Ruskin Bond). Basharat also mentioned that the “roohdaar” – Haider's father's twin soul, so to speak – was drawn from a real-life incident where a man, fired upon and dumped into the river (with a sack containing the chopped-up limbs of his friends tied to his back), survived to tell the tale. Another case of fiction huffing and puffing to keep pace with the implausibilities of real life. No wonder great Elsinore to high Srinagar can come. Oh, I'd imagined that you'd do a formal review. No? Words, words, words. How does it matter what is the matter? b) Shahid had a powerful scene when he shaved his head and went on to talk about Geneva convention, Armed Forces act etc. He messed it up. It was a poorly acted scene for me. That Bismil song again was bad acting by Shahid. c) Irfan’s deadpan is a little over-used for me. Besides, the scene in which he was introduced seemed more like from a Mithun or Salman Khan movie with pop music in background (or whatever the genre of music). The use of music also was average for me. I think background score of Haider trivialized the plot on many occasions. He used music badly even in the scene when Shahid killed two Salman Khan fans. The music used just when he was chasing them was triviliasing the plot. I think just around the time he was in the act of finishing them, the music changed and became more acceptable. Pessimist Fool: all interesting points, thanks. Yes, I did think about that aspect of the ending too: the apparent moral lesson of "an eye for an eye will make the whole world blind" does get muddied somewhat by the fact that Khurram is already mortally wounded and suffering terribly. I suppose the ending that would have satisfied me most would be one where Khurram was injured but not fatally so, and Haider was poised over him with the gun, and then there was a fade to black with the two voiceovers playing one after the other, or even simultaneously. Leaving the whole thing open, and letting each viewer bring his own feelings and his own conscience to the table. I don't know about music trivialising the plot, because again, that sort of thing is very much in the proper spirit of Shakespeare. In even the profoundest tragedies, when they were first staged 400 years ago for the "uncouth masses", the buffoonery of characters like Rosencrantz and Guildensterm shared the stage with all the heavy-duty emotional stuff that was going on. Yeah I may have little logic in disliking the music if that was the intent even in Hamlet. I have to watch the movie again to know more clearly why I liked it. Opened in NYC yesterday to good reviews, particularly for Tabu. I like the fact that the NY press is taking the film seriously, a rare occurrence for Hindi cinema here. Your article made it a must-see -- not that we wouldn't be at any new Bhardwaj flick anyway! Conflict in Haider is looming large in loci, macro and microcosm; in both movie’s locale (Kashmir) and its various characters (Haider et al). Is the loyalty towards a geographical precinct more important that its denizens? Is concept of India more important than Indians being denied a chance, to exercise self determination, at the cost of nationhood? How does one respond, when one discovers adultery of his most dear and respected kin (mother)? And the next-of-kin (uncle or girlfriend’s father) is a traitor? What would, thereof, be his relationship with them? How does a woman deal with a soft corner for someone other than her spouse? Oedipal complexities? Are these feelings natural or a transgression? The movie’s climax is heart wrenching when the protagonist has two choose between ‘not-so-ideal’ advice from an 'ideal’ person to its reverse permutation. It is these kinds of undercurrent that fraught the movie, making it for a compelling tale. 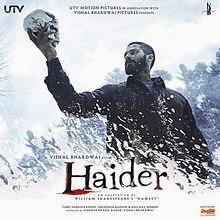 The play's plot is Haider's forte however Bhardwaj’s treatment is what makes the drama a compelling sight. He is bang on, while choosing Kashmir, to set his plot. You are transported to this corner on earth from scene one. You are made to wonder how an alluring landscape with its serene lake and placid rivers is in a state of turbulence and turmoil? How spotless expanse of milky white snow has been soiled by blotches of red gore? How the lofty mountains are witness to such lowly cruel crimes? These vivid contrasts of this fractured land are so well captured by its cinematographer that makes watching the film an absolute visual delight. Fate of its protagonists is no different; from a gentle poetry student to raging militant. From a love struck fiancée to an emotional wreck. From a loving mother to a sly bedswerver. The movie remains brutal and does not empathise with its characters. However, as audience you do, as you understand them. Bhardwaj is prolific creative artist and not just an filmmaker. This gets evident in this film, too. Music is his strength so is use of poetry. I was delighted to have more of Faiz Ahmed Faiz than Gulzar. Irfan, Menon and Tabu remain understated and that was their strength. Shahid, in all fairness, was pleasant surprise, possibly, because I had my apprehensions about his abilities. Shraddha, too, was not disappointing, rather, she looked refreshing as young Kashmiri. Light moments from Salman and Salman and well choreographed dance in the song “Ek Aur Bismil” were respite in what is predominantly a heavy / dark film. The movie remains poetically incorrect and I admire that. Bhardwaj has the gall (read:chutzpah) to call spade a spade. Something our jingoistic Bollywood should learn by shedding its chauvinism. But there seems to be sympathetic tilt towards separist view and lopsided censure for Indian Army. Ruthlessness of Kasmiri militants should have had its share while portraying Kashmir's complex reality. Though, I like the film’s grand canvas but the movie could have done away with some of the good old Bollywood clichés. The climax need not have been so, over the top, with stereotype unrealistic fight sequences. Or Haider's melodramatic eccentricities. Or non coherent storyline and unnecessary subplots But these are just few bad peanuts in bowl full of perfected roasted and adequately salted, sumptuous treat. Kashmir 1995 is not likely to generate any kind of patriotic nostalgia, on the contrary, it is a gruesome reminder of the excesses committed by armed forces to crush the not so peaceful movement to secede from mainland. 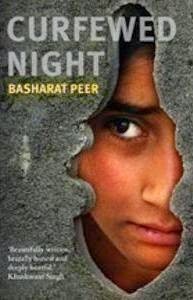 Basharat Peer's celebrated work 'Curfewed nights' is a graphic description of Kashmir tragedy with its political and human dimensions. Inexhaustible list of missing persons leaves a pall of gloom and suffering for their families and society in general. It multiplied disaffection with the Indian states and leaves a wide margin for its adversaries. Basharat Peer's adaptation of Shakespearean play Hamlet in the backdrop of Kashmir created a unique cinema which conducts vivisection of 1995 turmoil torn valley. The adaptation is loose and good for the near real portrayal of events. Haider, the eponymous protagonist, is a week vulnerable, susceptible and uncertain link with mainland. He is evolving under the shadow of terrified atmosphere created by gun toting separatists and armed forces. His mother played by Tabu is an apt metaphor for Kashmir painfully maintaining her relationship with her doctor husband who provides succour to the physical injuries sustained by Kashmiris during their struggle to assert their existence. Haider's mother romantic fling with her husband's younger brother- Khurram is representative of opportunistic class in trouble torn Kashmir. Rosencrantz and Guildenstern of the Shakespearean play are convincingly played by Salman's fans treacherously engaged in the espionage activities against protagonist. Irrfan Khan replaces the supernatural element of the play and is one of the finest character creation by Vishal Bhardwaj. Death of Haider's beloved symbolizes the partial success of the inimical forces to the interest of the people of the valley. The grave diggers exhuming the skull (Yorick’s skull in the original play) and handing it to Haider is a direct adaptation from the play but here narration with philosophical undertone steps in to put the stamp of the panchtatva - the subcontinental philosophy about life and death in no uncertain terms. The denouement comes with the self annihilation of Haider's mother- the metaphor for Kashmir and Kashmiriyat with the message to liberate Kashmir from the cycle of revenge and violence. Vishal Bhardwaj has captured the topography and culture of the valley at a very nuanced level which no other director has done so far. The buzz is around in the left leaning intellectual circles of the academia and media about appropriating the narrative war waged by the educated/ intellectual class of valley will turn out to be non sequitur if we scrutinize the contents of the movie which could have troubled New Delhi in it’s every facet. Music of Vishal Bhardwaj is very soulful which captures the vignette of melancholy descended on the valley along with the sanguinity of violence perpetrated by the warring parties. With Haider, Indian cinema has come of age and movie is going to be a milestone in the annals of the history of Indian cinema! Life, invariably, brings you at crossroads when you have to make choices. Pick one and leave another. In every choice conflict is implicit. At the root of these conflicts is the complex interplay of divided loyalties. Our loyalties is made of up of our ‘likes’ and our ‘values’. And in every choice there will be a tacit assault on either our cherished 'likes' or our esteemed 'values'. More often than not, guilt and regret does ensue, in every act of omission and commission. Damned if you do damned if you don’t. Every sensitive human mind gets invariably plagued from regret, guilt or conflicts. And this human predicament is brought out, with exceptional finesse, in works of one playwright, the hallowed, you know whom. In Hamlet, he weaves a tale in which human conflict of divided loyalties, comes to fore, in its ugliest and barest form. Haider, is a celebration of Bhardwaj ‘s extraordinary ability to deliver contemporary and geographically relevant adaptation, of this enticing tale. Roohdar's entry scene reminded me of the iconic scene from The Third Man - the introduction of Harry Lime. I did not like the voice overs in the final scene - particularly because it ties up to what Kulbhushan Kharbandas character says earlier - thereby making this somewhat of a message movie , at least from a certain view point. seem authentic. He wasn't able to bring any conflicting shades into his personality. Yes, but I think if it had ended with the two voiceovers being given equal weight, and the sense of "So what's it going to be, eh?" then it wouldn't have been an outright message movie. I thought Kay Kay was fine, but yes, the character as written was definitely one-note. Mukul Kesavan has a piece that touches on that, btw - about how Khurram has no shades at all, so it's difficult to understand why Ghazala is attracted to him. The objection was not for not projecting an "unblemished" view of the Indian army (the sarcastic tone is very obvious there which really saddens me) but for not projecting the whole truth, or, more objectionably, being mischievous with the truth itself. A very clever method has been applied -- paint the army first in a very dark colour, and then put a line in the mouth of an even darker officer of the same dark army on the plight of the Kashmiri Pandits -- thus by association establishing that the whole thing about the KPs is rather a lie! Again, this is the single reference on the whole issue that is made in the film, that too perhaps inserted more to blunt any criticism that might come its way than to genuinely present the facts. Sad, the way everything in this country is politicised!